When a 6 year old artist speaks to the children of Earth, what is it he has to say? Marco’s message is one of belonging, and making a decision to find your people in the world. Let me begin with telling you how this particular story got started with a red thread and intentional creativity. Emily told me about Marco when she interviewed for the Color of Woman Method Training and I knew somehow he was a part of our connection. Since Emily was already such a brilliant and accomplished painter and already teaching classes, I wondered secretly if Marco was involved, and now he has become her first student of the method. Sometimes I think the children call their mothers to this work. 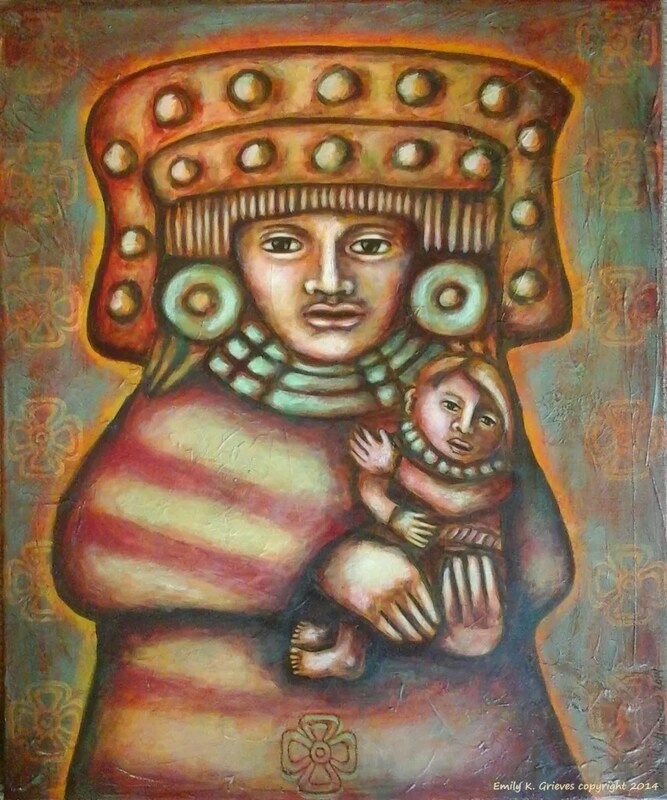 A call through the Mama to creativity at a deeper level than what is offered in school. I have mothers say to me all the time – I am raising my children differently due to working with intentional creativity and I always want to know how…and what it looks like. I love to see the photos of the children who are creating art and many of them doing the method step by step with their mama’s guidance. It JUST warms my heart and helps me to understand the deeper messages of my call to share this work in the world, and the impact on the future generations. 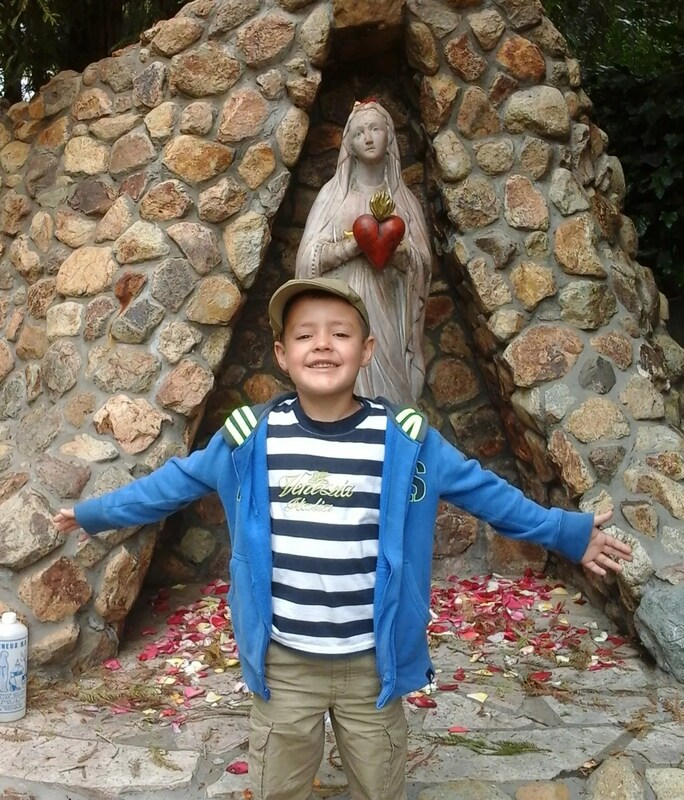 I recently got to meet this lovely being of wisdom, Marco – and here is a photo of him in front of our Virgin Mary grotto when his family was traveling here for the Color of Woman Training. Being from Mexico – of course the Virgin is of utmost importance and his family makes pilgrimages yearly to the Nuestra Senora de Guadalupe. In the Color of Woman training I teach these very simple classes called Red Thread Sessions, which are for use in Intentional Creativity Coaching sessions and are done with acrylic on watercolor paper. They are able to be done in a hour and a half or half days, instead of the full 13 steps which takes at least a weekend. I started the method through teaching children so this is a wonderful full circle for me – and I am so glad that Marco asked Emily to be her student. So, Emily has been teaching Marco the Red Thread Sessions and some of his works and words are below as well as context from his Mom. I have shared with their consent, Emily sent me some parts of their story as it occurred through email and in our private class. Thank you Emily – and Marco for being willing to share this beautiful message with us. Here’s a message to me from Emily after I asked her if she would ask Marco if I could share his story. Emily: I asked Marco and he is happy to share his stories, although he wanted to know which of his 4 stories – present Earth life? Past life in Paris on Earth (apparently his only other human life he’s ever had, which is one reason why he’s so obsessed with Paris? Venus? Angel? 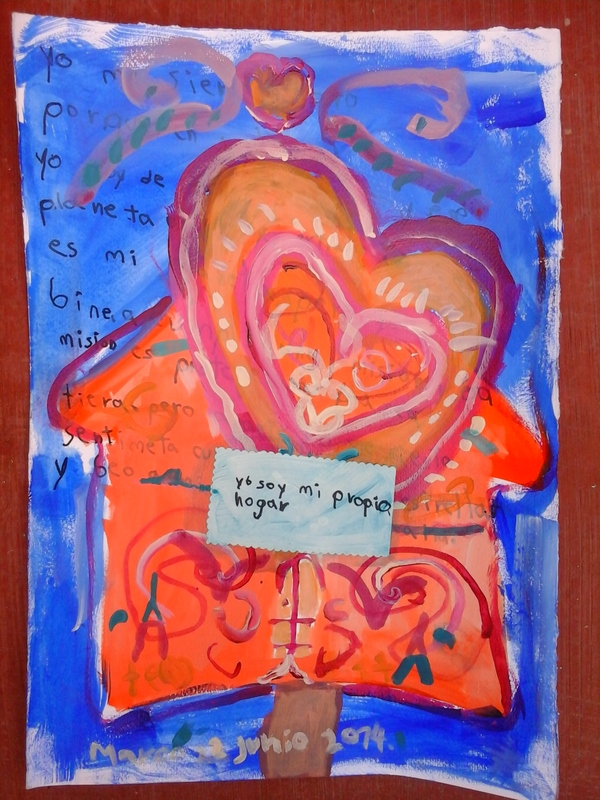 I explained to him that it was the 2 stories about his process painting (using the Red Thread Sessions) – making the Affirmation cards and making the House of the Heart. Ah! Ok, no problem! I said if you shared his stories perhaps it would help adults learn to help other children like him who come from other places and have a hard time adjusting to life on Earth. To which he replied, I think I’m the only kid like me in my school….. I’m sure he is! Who else comes out of school with a gold star stuck to his forehead for having done good work and says,”My gold star didn’t bother my 3rd eye today because I closed it before the teacher stuck it on.” I might have to start dressing him in plaid like your mom did to you so that people will think he comes from a normal household! LOL! So we already know we are dealing with a great mind here! Doesn’t this just make you smile? Here is the first Red Thread Session that Emily taught Marco, it’s called the Soulful Story Affirmation Cards. In one variation on this session we work with your existing story of challenges and limiting negative beliefs. Your ‘old’ story goes on one side and the transformed story on the other side as antidotes to the negative beliefs. 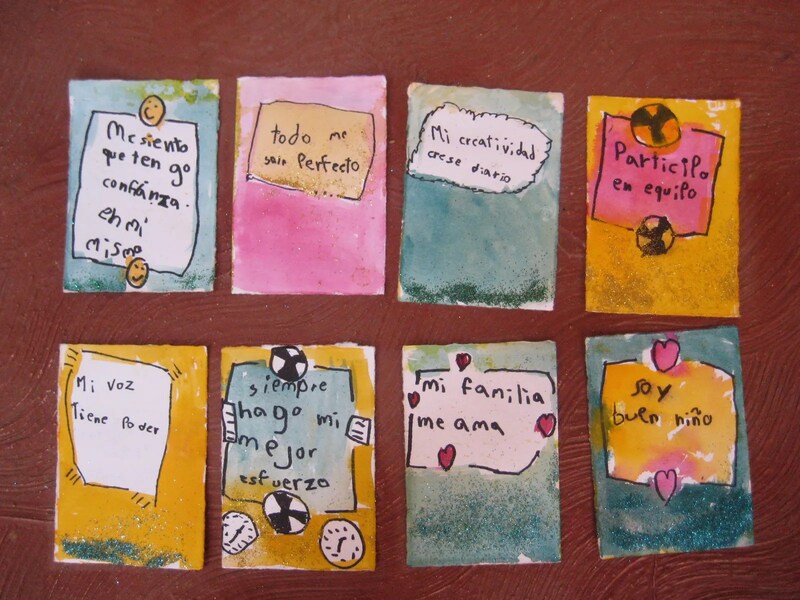 Below are Marco’s Affirmation Cards. Which by the way, are covered in glitter – he showed each one to me when he was here visiting from Mexico, it was a very special moment for me to be with him. Here is what Emily first shared in our private group…Enjoy! Emily: It’s so exciting to see everyone’s breakthroughs and triumphs on here! I inspired one person at least – My 6 year old son! 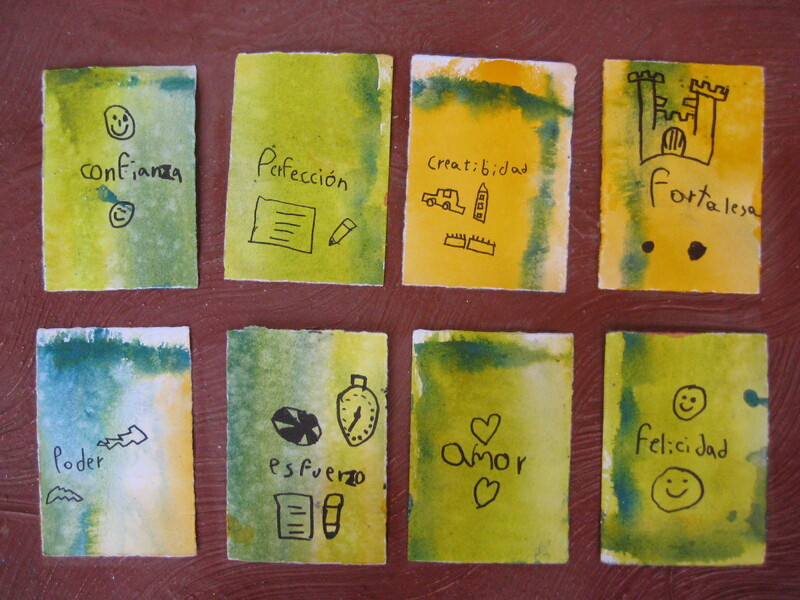 He saw my deck of Affirmation Cards and wanted to make his own. It was pretty intense as we went through his negative beliefs together and I helped him come up with remedies/antidotes to them. It is sort of unbelievable how many negative beliefs a 6 year old already has accumulated, but I couldn’t be happier that he was inspired to shift them. The second Red Thread Session Marco did is called the House of the Heart and has to do with belonging and identifying your place and space and working with your own experience of “home”. My 6 year old son Marco, who some of you met in CA in May, begged me for weeks to be my “guinea pig” for one of the exercises, so I finally did the House of the Heart with him. Like the Affirmation Cards it turned into quite an intense little process with him. He has a really hard time being here in human form on this planet, so the exercise was perfect for him. His “old story” was all about longing to rejoin his family on Venus, how much he misses them, and how weird he feels being incarnate on Earth. After painting his house, his hearts, writing “Te amo” and of course including a couple little Eiffel Towers, it was time to write his new story… and he couldn’t come up with one because he was still so much in his longing for what he had written about his “old” story. The thing was not healed or shifted or transformed. He finally wrote “I want to feel like I’m from here.” I looked at him and said, that doesn’t feel very satisfying, does it? He said, but I have to be in 3 realities (according to him: Venus, angelic realm, and Earth) at the same time and the one that feels weird is this one! I asked what is the one thing those 3 realities have in common? Where are you when you are aware of any one of those realities? The dawning expanded across his little face. He is! Yes, you are the common denominator! Wherever you are, there YOU are! So he wrote quite determinedly “I am my own home.” Whew, that was a tough one, but I loved doing it with him and love that he hung it up in his room to remind himself. Such a great process for the little ones! For those of you getting a kick out of my son Marco’s artwork and his way of learning vicariously through my COW studies, here’s another one for you. He asked where I get the ideas for my paintings, and I told him about visioning. He immediately was like Oh, oh, oh, I have a vision! So I said well, draw it and paint it, which he did immediately. 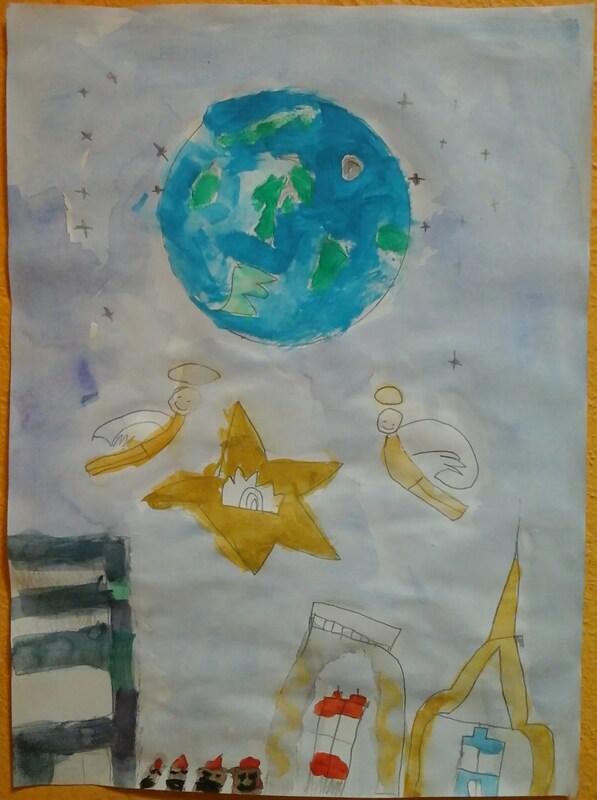 The result explains a bit more about his “3 realities” – Earth (with a tiny Eiffel Tower visible in the midst of all that green and blue- I guess that green blob is France), angels, and Venus (the star with the symbol in it between the angels). He hung this one right over his bed. After seeing Marco’s creations and insights, I asked him if he would share with other children who might also feel like they don’t belong here. I know many children, and adults, who have a sense of being from somewhere else and because of that, feel misplaced and like they don’t belong. Marco’s wisdom is timeless and for all ages. What struck me the most about his message below is that is using his new knowledge, the knowledge he gained from doing the artwork and story-work. In the House of the Heart he really got it that HE was his own home. And then when asked to share with others, he passes on the message. Emily translated it from Spanish but I included the Spanish below. What I want tell other children and youth who do not feel that they belong here is that they are their own home. They have to feel like they’re in the company of others like them. We are all the same if we are all united. You have to feel united to feel like you belong here, together with those who are like you. If those who are like you don’t find you, you need to look for them. You have to search for them by communicating telepathically. Once found, you have to remind them that they are from the same place that you come from. The work is to make everyone remember where they come from. If you are from elsewhere, some other planet or star, you have to look for those who are also from that same place. Once you gather together those for whom who are searching telepathically, you’ll have more energy. When you have more energy, you will be able to communicate telepathically with your place of origin. You will be able to travel there telepathically. I don’t know why I came here except that I came on a mission to protect planet Earth. In your search, you must never give up. Lo que quiero decir a otros niños y jóvenes que no se sienten que pertenecen aquí es que ellos son su propio hogar. Tienen que sentirse en compañía. Todos somos el mismo si todos somos unidos. Tienes de sentirte unido para sentirte que estas de aquí, unidos con los que son como tú. Si no te encuentran, los tienes que estar buscando. Los tienes que encontrar, comunicándote telepáticamente. Una vez que se encuentran, tienes que recordarlos que son del mismo lugar, de dónde vienes. – el trabajo es hacer a todos recordar de donde vienen. Yo por ejemplo, soy de Venus. Yo busco a otros que también son de Venus. Si tú eres de otro lugar, planeta o estrella, tienes que buscar a los que también son de tu mismo lugar. Una vez que se juntan a los que buscas telepáticamente, vas a tener más energía. Teniendo más energía, puedes comunicarte telepáticamente con tu lugar de origen, puedes hacer viajes allí telepáticamente. No sé porque vine aquí más que vine a una misión para proteger a planeta Tierra. En esa búsqueda, nunca te tienes de rendir. I am so grateful that Emily and Marco have crossed my path – thanks to Jenafer Joy who is friends with Emily. We feel our red threads from the Virgin have called us together. When I read Marco’s words, it strikes that homing cord within me. I have always felt that one of my gifts was a feeling of belonging here – but because of that gift, have worked diligently in my teachings to guide others into the space of belonging since it is such a powerful place to move from. When we don’t feel like we belong and aren’t with those who are ‘from where we are from’ it is much more difficult to be grounded into form and deeply connected with Source, and with energy. I LOVE how he talks about having more energy when you find those that you belong with – yes indeed, tribe brings a sense of knowing who we are, creates a space of who we can be, and provides that gift of belonging. Today in the Red Thread Cafe I have a houseful of people – Jonathan’s children are here from Florida with dog and cat in tow – yes they moved in two weeks before the wedding, lol. And Sue and Jonathan are at the kitchen table working on our trip to Paris. Life is mysterious, good and overflowingly full. Soon I will be sharing my last posts and events for a while and will be going on my honeymoon break ~ but today I wanted to share Marco with you.